Husky Golden Retriever Mix - Is This Friendly Dog Right For You? You are here: Home / Breeds / Mixed / Husky Golden Retriever Mix: Unusual Cross or Killer Combination? Are you familiar with the Husky Golden Retriever mix? 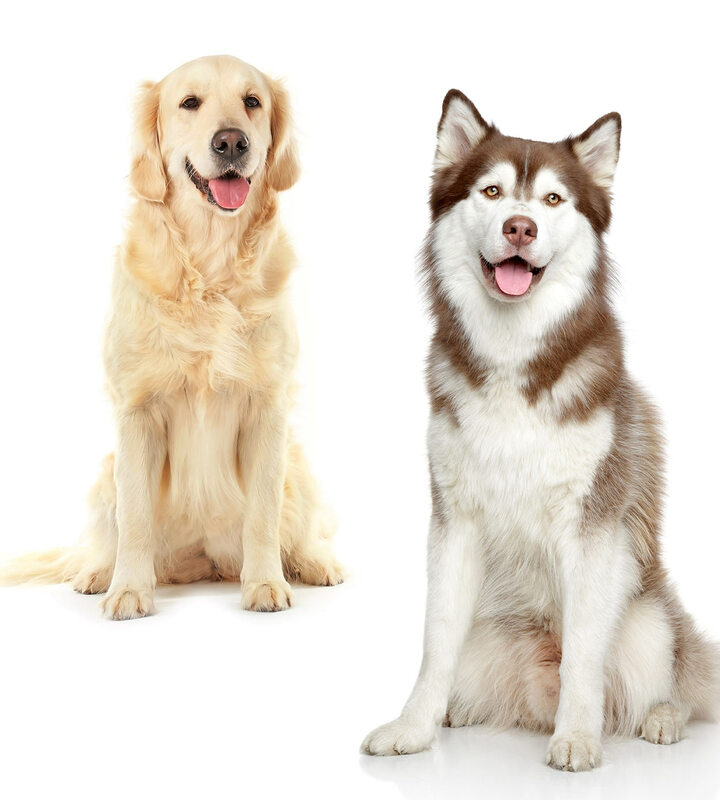 It’s a cross of two of America’s most popular dogs: the Siberian Husky and Golden Retriever. If you’re wondering whether the Siberian Husky Golden Retriever mix is the right dog for you, you’ve come to the right place. But first, since this is a mixed-breed dog, let’s take a quick look at the controversial debate about mixed breeds vs. purebreds. What happens when you cross two different purebred dogs? When you interbreed different purebred dogs, the resulting puppies are called designer dogs. This is how all the “doodles” came about. So, why is this so controversial? First, some people feel that these designer dog breeders are not held to the same standards as purebred dogs. They believe this puts the dogs at a greater risk of being mistreated, unhealthy or sold as something other than what they are. In some cases, this is true. But not in all cases. Designer dogs can’t be registered with organizations like the American Kennel Club, but there are designer dog registries that help regulate them. And while there are always questionable breeders out there, there are also plenty of reputable sources of mixed breeds. The second reason some people dislike designer dogs is that they don’t like the unknown aspect of it all. When you cross two different breeds, it’s a lot harder to predict what the resulting puppies will be like. They could end up with the characteristics, needs, energy, temperament and personality of either parent breed. They could also end up with something in the middle. For some, selecting a puppy with so many unknown possibilities is not appealing. On the other hand, there are a lot of die-hard supporters of designer dogs. They believe it’s the only way to try to “save” some breeds of the genetic defects and health issues they now suffer from. Are mixed breeds healthier though? Not necessarily. It depends on the mix, the parents, the genetics and luck. However, there is research indicating that purebreds have reduced vigor in comparison to mixed breeds. That means that on average they will live shorter lives and have fewer puppies. The debate continues because both sides have some valid arguments. There is no clear right or wrong side. Not a lot is known about who started mixing these two breeds together. We do know that Golden Retriever Husky mix puppies started showing up on the market sometime in the last two decades. And they’ve slowly been increasing in popularity. To better understand their backgrounds, we’ll briefly look at the history of each purebred parent. Huskies were originally bred in Northeast Asia as sled dogs as well as companion animals to the Chukchi people. It wasn’t until the 1900s, when the dogs started winning sled races, that they began to catch the attention of the wider population. In 1925, Huskies won the adoration of the globe. A relay of Siberian Huskies covered 658 miles in only five and a half days to rush a serum to a diphtheria outbreak center in Nome, Alaska. It was covered by newspapers worldwide. The lead dog of the final leg, Balto, is still one of the most honored heroes in canine history. Since then the dogs have come to be known as excellent working dogs, and have been used as search-and-rescue dogs, sporting dogs, and companions. The breed is currently the twelfth most popular breed in the U.S., according to the AKC. Golden Retrievers were first bred in the Scottish Highlands. In 1840, a man named Lord Tweedmouth started experimenting with mixing breeds to make the ideal gundog. It took a few generations before the Golden Retriever came about. By 1908, it was first seen in a British dog show, and it started showing up in the U.S. around the same time. The dog was immediately popular for its usefulness, beauty and sweet temperament. In 1970, President Ford made Golden Retrievers even more popular, thanks to his beloved Golden Retriever Liberty. Today this breed is the third most popular dog in the US. Huskies are considered a medium dog. Male Huskies typically weigh between 45-60 pounds and stand between 21-23.5 inches tall. Females usually weigh between 35-50 pounds and stand between 20-22 inches tall. Golden Retrievers, on the other hand, are classified as a large breed. Golden Retriever males general weigh 65-75 pounds and stand 23-24 inches tall. Female Golden Retrievers average 55-65 pounds in weight and 21.5-22.5 inches in height. Huskies are compact, powerful dogs with plenty of fur, erect ears and bushy tails. These dogs are made for power, speed and endurance. Huskies have two coats, a dense undercoat for warmth and a top guard coat. They can appear in 13 different color combinations and with up to three different possible markings. Golden Retrievers are also powerful, active dogs. Although classed as sporting dogs, these dogs are no stranger to working, often taking part in hunting, field work, and search and rescue. The breed is also commonly used as guide dogs for the blind. Golden Retrievers are muscular and well-balanced, just like Huskies. Golden Retrievers also have two coats: a dense undercoat and a longer, water-repellent overcoat. However, that’s where the common appearance ends. These dogs typically have feathering around the neck, forelegs, underbelly, thighs and tail. As the name implies, Golden Retrievers are always a shade of gold in color. When considering Husky and Golden Retriever mix puppies, it’s important to keep these differences in mind. Any puppy is likely to be compactly and powerfully built. However, it could have the longer coat and floppy ears of a Golden Retriever, the shorter denser coat and upright ears of a Husky, or any mix of the two. Siberian Huskies are considered to naturally keep themselves quite clean. This means they often may not need more than a few baths a year. However, a weekly brush is important for the health of their coat and skin. Twice a year the undercoat is shed and will need to be raked out more frequently with a pin brush or metal comb. Golden Retrievers shed year-round, although they will shed more heavily twice a year. This means they need more frequent brushing, at least a couple times a week during the year and daily during shedding season. Goldens only need occasional baths to keep them clean, although more frequent baths may help loosen dead hair. If you do this, make sure your pet is completely dry before you brush it. Remember that a Husky mixed with a Golden Retriever could end up with the coat and grooming requirements of either breed. In general, both breeds are fairly low maintenance when it comes to caring for their coats. Siberian Huskies are friendly and gentle dogs who love to please. They also tend to be very alert and outgoing. Huskies shouldn’t seem overly suspicious, possessive or aggressive. They were bred to work in teams so are expected to get along well with other dogs. As pack dogs, they will likely enjoy the company of other dogs more than their humans. However, Huskies also have a strong prey drive. For that reason, they might not do well in a household with small dogs, cats or other small animals. In some cases, these dogs may seem reserved around strangers, but they are overall very agreeable and intelligent dogs that enjoy being put to work. Golden Retrievers have a similar temperament in a lot of respects. These dogs are known for their friendliness and reliability. Golden Retrievers should never display aggression or hostility toward people or other dogs. They also shouldn’t show nervousness or shyness unless it’s warranted. Golden Retrievers love human attention and affection. They are companion animals who are happiest with their family. A Golden Retriever and Husky mix is likely to do well with humans and dogs, but not necessarily smaller animals. In addition, it may not like being left home alone and could act out if isolated for too long. Both Huskies and Golden Retrievers are relatively healthy breeds. However, even with the healthiest of breeds, there are typically at least a few hereditary diseases. 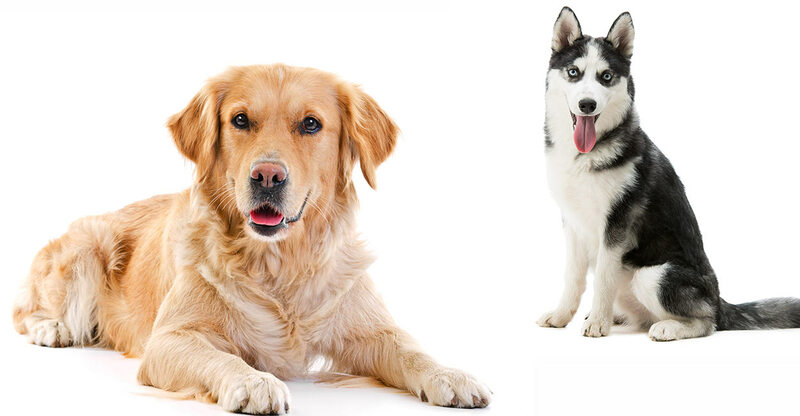 A Siberian Husky and Golden Retriever mix could inherit any of these diseases. It will be more likely to contract any illness that is shared by both breeds such as hip and elbow dysplasia, eye diseases, and hypothyroidism. If you are considering Golden Husky mix puppies, make sure they and their parents are tested for all relevant genetic disorders. Huskies and Golden Retrievers are both highly energetic dogs that need a lot of exercise. Regular exercise is important for them not only physically but also mentally. Daily walks, hikes or runs are necessary for a Siberian Husky x Golden Retriever. Another excellent exercise option is doggy playgroups because this mix is likely to love playing with others of its own kind. Be aware that Huskies are natural-born runners. This means if you let them loose they will likely run away. Both Golden Retrievers and Huskies are typically great with humans and other dogs. However, proper socialization and training are important. The temperament of a dog can never be guaranteed. Thankfully, these dogs should not be overly difficult to train. Both Huskies and Golden Retrievers are very friendly dogs that enjoy being around and pleasing people. Huskies may have a bit of an independent streak. That being said, consistent training with positive reinforcement can train them to be anything from a great housemate to an excellent sled dog. The best approach for training a Husky mix Golden is to make it as fun as possible for both yourself and your dog. Golden Retriever Husky puppies can easily be found online, thanks to their growing popularity. However, not every breeder will be reputable. It’s important to make sure you check into the background of the breeder. Also, visit the site, check out both parents, and make sure they and any puppy have been fully health tested. Husky Golden Retriever mix price can vary widely, based on the breeder, location and parentage of the puppy. In addition, the coloring of the puppy is also a factor. The rarer the color, the higher the price. If you want to buy a Husky Golden Retriever puppy, be prepared to pay anywhere from $250 to $1,500. A Husky Golden Retriever mix is generally going to be a very social dog. That means it will do best in a home where someone is around a lot. Having another dog in the house may also be beneficial. Be aware that a Husky Golden Retriever could act out or misbehave if left home alone too much. If you want to bring one of these dogs into your home, you should also be prepared for plenty of daily exercise. This type of dog will do best with an active family that loves outdoor exercise. Do you have experience with this mix? Let us know about it in the comments!